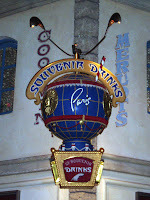 On my recent trip to Las Vegas, I spent a few hours in Paris. I didn't bother paying to go to the top of the Eiffel Tower since somehow I knew when I got to the top there would be no view of the Seine and I didn't want to spoil whatever illusions the place was capable of creating. Unfortunately most of my photos didn't come out thanks to the perpetual twilight of casino lighting but the place had its charms with lots of Napoleonic, Haussman, Art Nouveau and Art Deco touches and a beautifully painted "sky" to help one pretend. 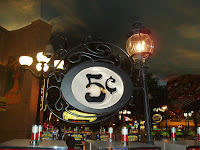 I was enthralled with the five cent slot signs for some reason. The juxtaposition of my beloved Paris iconography and the Vegas mentality just made me giggle. We did eat at Le Village, Paris' (indoor) outdoor buffet. In an ersatz courtyard under an ersatz sky surrounded by food stations each modeled after an area of France and offering a version of food celebrated by that region, we set up camp near the dessert station (I needed to keep an eye on the assorted tarts, brulees and other goodies so I could pace my consumption of everything else) and began our gastronomical tour of a Vegas buffet French style. 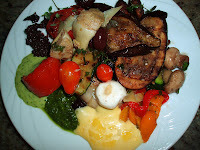 Over near the Provencal section I found an assortment of perfectly grilled vegetables and sauces, including aoili, pistou and black olive tapenade. Gary found the king crab legs (this is a Vegas buffet, after all). There was a lovely roast duck in honey lavender sauce, a surprisingly good coq au vin and lots more. Pretty much anything with a sauce was a winner, especially since most hot food was being made in small batches and replenished often. Of course there were the carving stations with acres of roasted animals, but we decided to focus on the more specialized offerings. My one disappointment? No cassoulet. And, when I asked about the availability of this famous French dish, one of the chefs had absolutely NO idea what I was talking about, and after I described the dish to him, he still had no clue. Oh well, there was bouillabaisse at least. This buffet was probably worth it just for the desserts ranging from American brownies (I am always surprised when I am in Europe how much the rest of the world has come to love this humble treat) and apple pies to cups of chocolate mousse, creme brulees, eclairs and other pastries, fruit tarts, clafoutis, cakes and much, much more. There were even sugar-free goodies, but why? 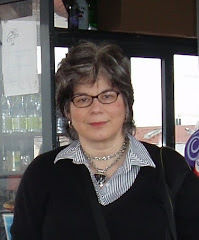 I return to Las Vegas in July (again for business) and I'd love to know about your buffet and restaurant experiences. If you have any recommendations (or must avoids), please leave me a comment below or email me through my profile.